Home » Wow! signal explained after 40 years? New evidence suggests the well-known Wow! signal from 1977 – long thought by some to be a sign of extraterrestrial life – was in fact generated by a passing comet. The internet is buzzing today over new evidence from Antonio Paris – an adjunct professor of astronomy at St. Petersburg College, Florida and ex-analyst of the U.S. Department of Defense – suggesting that the famous 1977 Wow! signal was most likely generated by a comet. The Wow! signal was detected on August 15, 1977 at the Big Ear Radio Observatory in Ohio, during a search for signs of extraterrestrial intelligence. 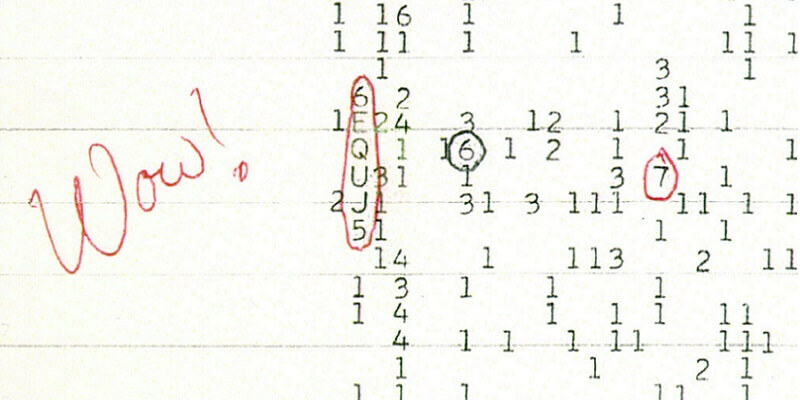 The signal was unusual, and, when reviewing the data a few days later, astronomer Jerry Ehman wrote “Wow!” next to it. Since then, for 40 years, some have claimed the signal was made by aliens. Others have said a star caused it. Many people theorized as to what might have caused the signal, but there has been no agreed-upon explanation. Paris and his team learned that two comets, 266P/Christensen and P/2008 Y2 (Gibbs), were passing through the part of the sky the Big Ear Radio Observatory was surveying in 1977, when the Wow! signal was noticed. These astronomers believe the signal came from a hydrogen cloud accompanying one or the other comet. This idea would explain why the Wow! signal was not measured again: the comet that caused it moved on in its orbit. Paris and team recently took an opportunity to survey the region of the sky around Sagittarius once again, using a 10-meter radio telescope, when Comet 266P/Christensen was again passing through this region. They determined that the signal of 266P/Christensen (and three other comets) matched the Wow! signal. The original signal from 1977 was stronger than the signal these astronomers observed from Comet 266P/Christensen. Paris and his team explain this by the fact that radio telescope they used (10 meters) was smaller than the Big Ear Radio Telescope, whose sensitivity is equivalent to a 52.5-meter radio dish. Moreover, because comets lose mass as they pass into the inner solar system, Comet 266P/Christensen would have been more massive 40 years ago. Paris admits it is not certain that the Wow! signal was generated by Comet 266/P Christensen; however, his team concludes that the 1977 Wow! signal was a natural phenomenon generated by a comet. Paris’ paper – about his team’s observations and their ideas on the Wow! signal – is not published in one of the usual journals, but it does appear online via The Center for Planetary Science, a 501(c)(3) non-profit organization, of which Paris is Chief Scientist, according to his LinkedIn page. Location of the Wow! signal on a star map. There are 2 possible regions indicated here; the ambiguity is due to the way in which the original 1977 experiment was designed. Image via Benjamin Crowell/ Wikimedia Commons. Bottom line: Astronomer Antonio Paris and his team have new evidence suggesting that the well-known Wow! signal from 1977 – long thought by some to be a sign of extraterrestrial life – is in fact a natural phenomenon and was generated by a comet.